A police car at the junction of Collier Row Road and Ramsden Drive in Romford. A MAN HAS been killed after he was shot by police in London in the early hours of this morning. Police were called by a man making threats and claiming he was in possession of a firearm at an address in Collier Row in Romford at about 3.50am this morning. Firearms officers attended the scene and were informed that the man had left the address armed with a firearm. 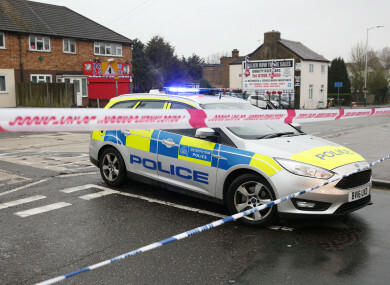 At about 4.45am, a man – believed to have been aged in his 40s – was shot by police near Collier Row Road and Lodge Lane in east London. The man was pronounced dead at the scene at 5.17am. Police said that road closures remain in place around the scene. The Directorate of Professional Standards has been informed and a mandatory referral has been made to the UK’s Independent Office for Police Conduct. Email “Man (40s) shot dead by police in east London”. Feedback on “Man (40s) shot dead by police in east London”.